The BAUMA CONEXPO Show – bC India, is an International Trade Fair that is for Construction Machinery, Building Material Machines, Mining Machines and Construction Vehicles. The last event in February, 2013 in Mumbai attracted a total of 710 companies from 33 countries and more than 28,000 trade visitors to attend. Following the successful events in Mumbai, bC India is moving to Delhi for its next show. And it will take place from December 15 to 18, 2014 at the India Expo Centre in Greater Noida / Delhi. There are 170,000 square meters of premium exhibition space, 28,000 square meters of modern indoor, exhibition space and 142,000 square meters of presentation space outdoors. And there will be a total of seven joint pavilions from China, Germany, Great Britain, Italy, Korea, Spain, and the United States with their good quality equipments of high technology to show. Zenith will take part in bC India 2014 during December 15th-18th. 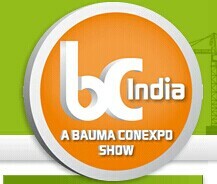 The Exhibition Name: BAUMA CONEXPO Show – bC India 2014. Address: India expo Centre, Greater Noida / Delhi.